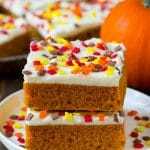 These pumpkin bars are light and fluffy cake bars made with pumpkin puree and spices, then topped with a layer of cream cheese frosting and sprinkles. A fall favorite dessert that’s perfect for feeding a crowd! It’s that time of the year for all things pumpkin! My family loves pumpkin chocolate chip cookies, pumpkin gooey butter cake, and of course these pumpkin bars with cream cheese frosting. Fall is finally here, and with it comes every pumpkin treat imaginable! I’m sharing a classic today with these lightly spiced pumpkin bars. This is essentially a pumpkin sheet cake topped with the most delicious cream cheese frosting. How do you make pumpkin bars? This is a one bowl recipe of pumpkin puree, sugar, oil, flour and eggs. Don’t be tempted to use pumpkin pie filling here, it’s not the same thing as pumpkin puree and you will not get good results. This recipe calls for a jelly roll sized pan which is 10″x 15″. You can try to make this recipe in a 9″ x 13″ pan, but the bars will be thicker and take longer to cook. I prefer the thinner bars so that you end up with the perfect cake to frosting ratio. How do you make cream cheese frosting? This cream cheese frosting is made with cream cheese, butter, powdered sugar, and vanilla extract. You can make your cream cheese frosting as thick or as thin as you’d like. Simply add more powdered sugar to make the frosting thicker, or add milk, a teaspoon at a time, to thin out the frosting. 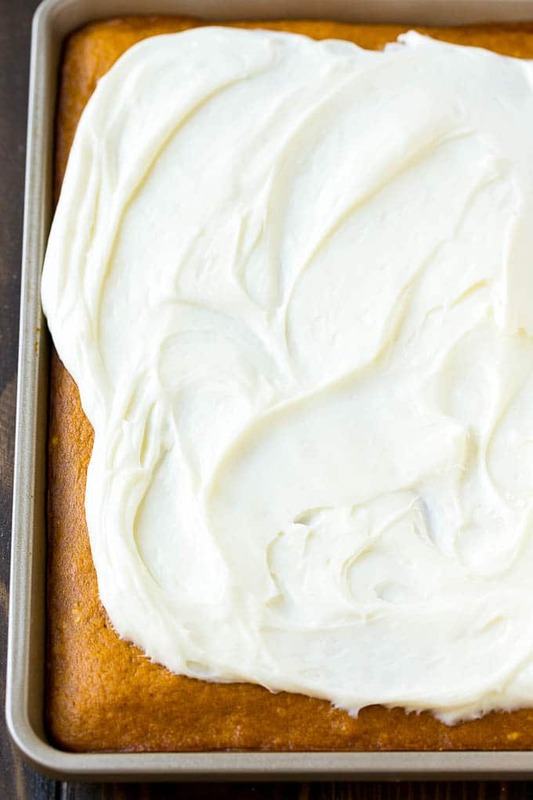 Use an offset spatula to make sure both your pumpkin bar batter and frosting are spread in even layers. 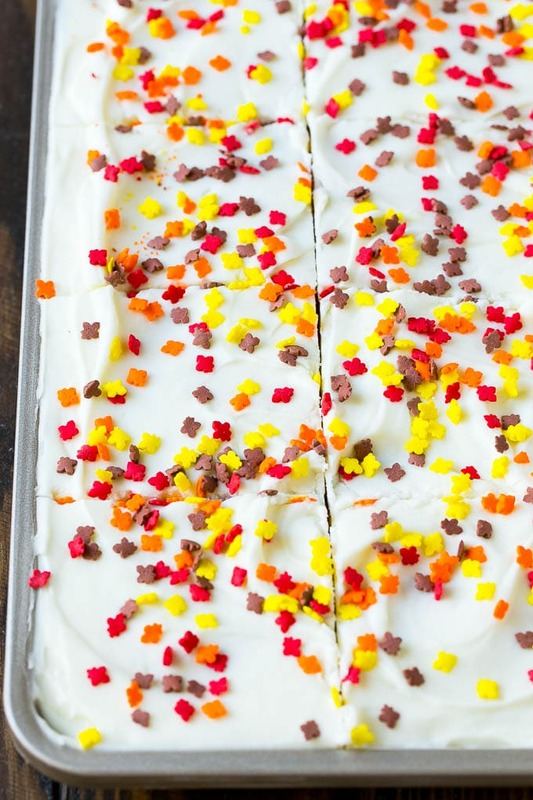 Top your pumpkin bars with festive fall sprinkles or candy pumpkins to dress them up! Pumpkin bars keep in the fridge for up to 5 days. Keep your bars loosely covered, and it’s best to cut them just before serving. You can reduce the fat content of these bars by using 1/2 cup applesauce and 1/2 cup oil instead of the full cup of oil that the recipe calls for. Just be aware the texture may be a little different in the end product. To make these pumpkin bars even more decadent, add a cup of miniature chocolate chips to the batter before you bake it. I make these pumpkin bars all through the fall months. They’re great for class parties, as an afternoon snack, or for a Thanksgiving dessert to feed a crowd. They’re a fall tradition in my house! 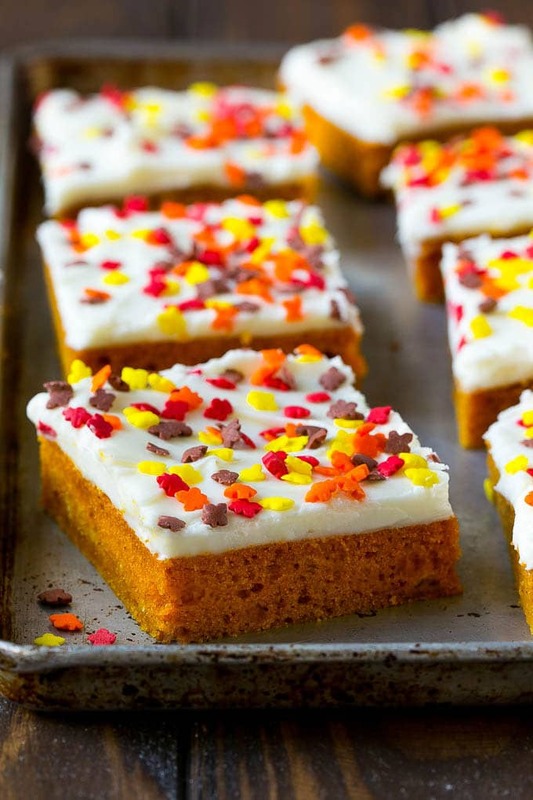 These pumpkin bars are light and fluffy cake bars made with pumpkin puree and spices, then topped with a layer of cream cheese frosting and sprinkles. A fall favorite dessert that's perfect for feeding a crowd! Preheat the oven to 350 degrees F. Line a 10”x15” pan with parchment paper, then coat the pan with cooking spray. 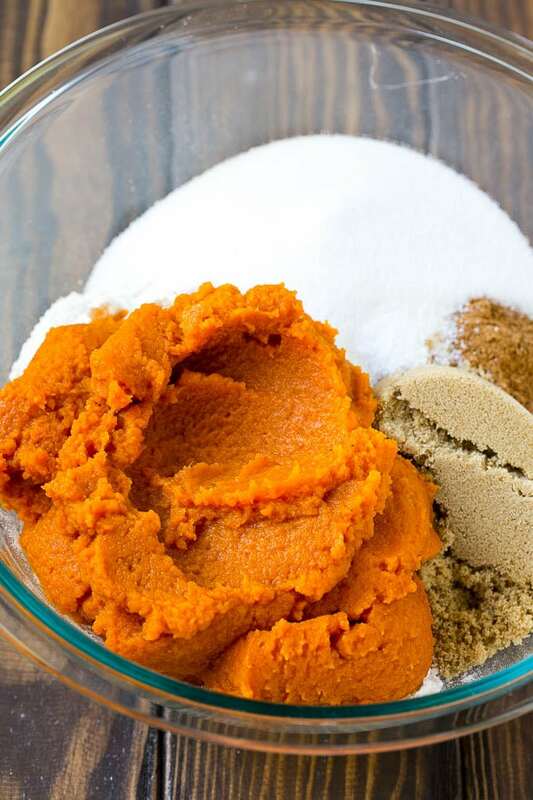 Place the flour, sugar, brown sugar, pumpkin pie spice, salt, baking soda and baking powder in a large bowl. Stir to combine. Add the vanilla extract, eggs, vegetable oil and pumpkin puree to the bowl. Stir until just combined. Bake for 25 minutes or until set and lightly browned. Cool completely in the pan. Place the butter and cream cheese in the bowl of a mixer and mix until light and fluffy, about 2-3 minutes. Add the powdered sugar, one cup at a time and mix on low speed until combined. Add the vanilla extract and mix for 30 seconds. If the frosting is too thick, add 1 teaspoon of milk at a time until desired consistency is reached. Spread the frosting evenly over the pumpkin bars. Top with sprinkles. Cut into squares and serve, or store in the refrigerator until you’re ready to eat. 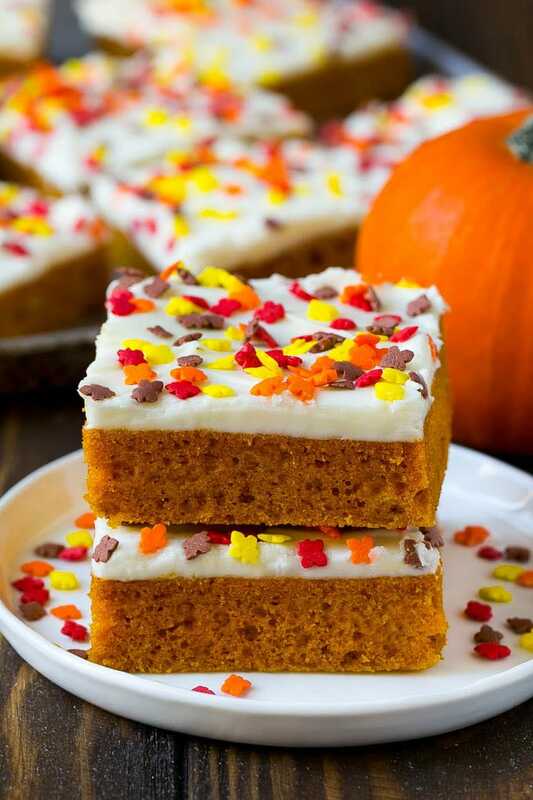 These pumpkin bars look delicious. They look easy to make too and takes less time hen one can think. Will definitely try it. I made these yesterday and they were so delicious and moist! Everyone sure enjoyed them! Those pumpkin bars look so good. And they’re almost too pretty to eat. I can’t wait to make them. Thank you for the recipe. Oh they look so delicious! They are so thick and the icing looks great too! 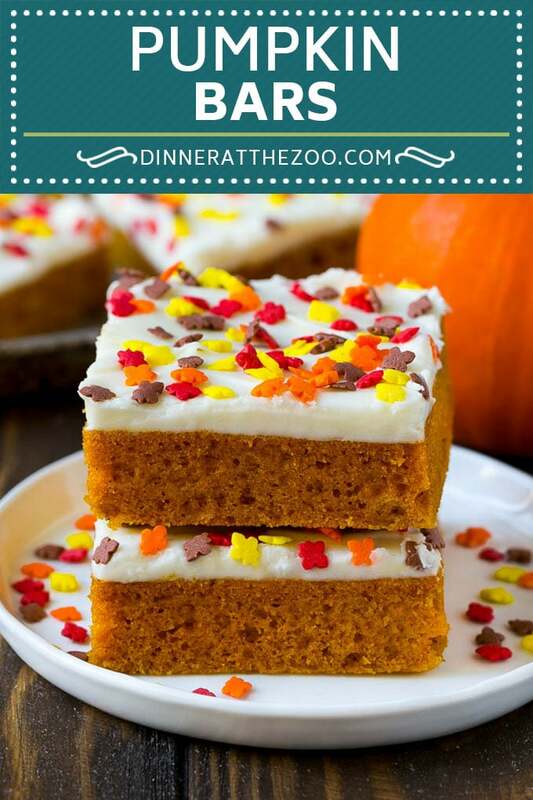 I love anything pumpkin and these look absolutely amazing! Looks like I have some ingredients to purchase tomorrow. I haven’t done a pumpkin dessert for a while now. I think this will be perfect for the whole family. Looks so yummy! I love the texture and the color of these bars! They are so perfect as a snack to have on hand! I need to try them next week! We have a local bakery that makes something similar and they are delicious! I am constantly trying to acquire their recipe, to no avail. This, I will have to tey for sure, see if it beats theirs! OMG, I bet this tastes amazing. I am a sucker for pumpkin. I am bookmarking this to make this weekend. Thanks! These look so amazing! I can’t wait to try them out. I’ve been wanting to make something with pumpkin in it, and now I know what to make! Yum! These look absolutely AMAZING. 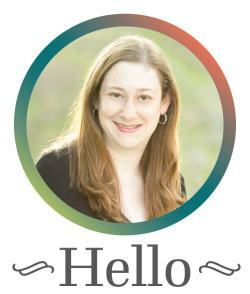 I totally saved the recipe to Pinterest so I can try it soon… The kids would love this too.